Joint Opposition is holding a gathering in Malè City, after being allowed to do so for the first time since 2015. The opposition gathering has concluded. "Everyone gathered here tonight has shown us that nobody wants a cunning, tyrannical leader" Waheed concluded speech. "President Yameen promised us development, what we got instead was sucked into a debt-trap" Waheed. "There is no candidate like our honest, humble Solih" Waheed. Mohamed Waheed Ibrahim from Maumoon Reform Movement (MRM) has taken the podium after MP Anara's speech. "This is a very pleasant scene to sore eyes. This is what was observed in Malaysia, Pakistan and Sri Lanka. 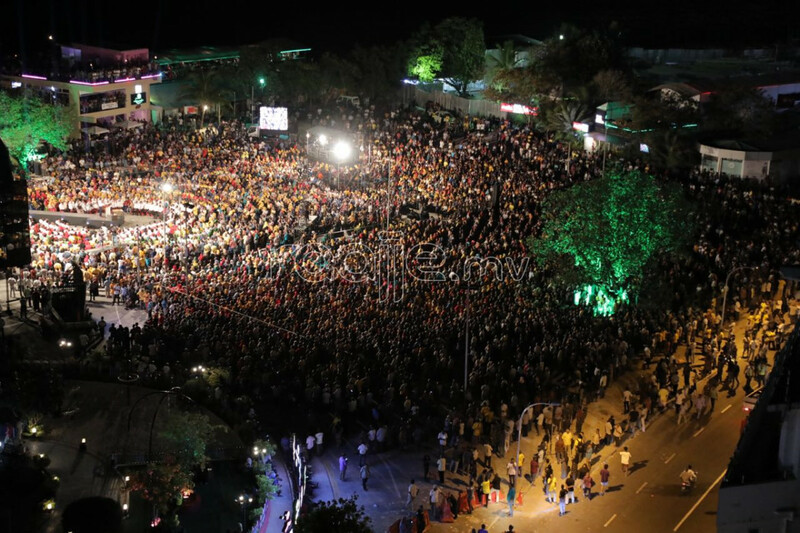 This is Maldivian citizens saying no to corruption" Anara. Makunudhoo MP Anara Naeem has taken the podium after Nahula's speech. 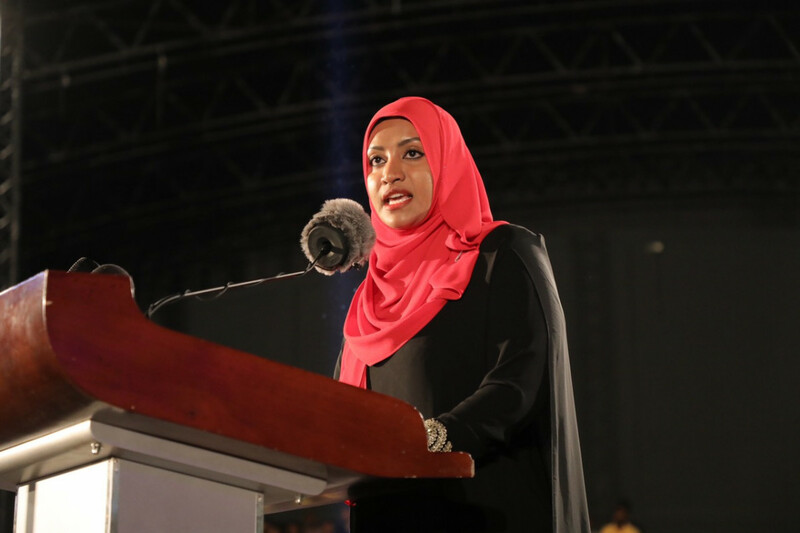 Jumhooree Party's council member and leader Qasim's youngest wife Aishath Nahula has taken the podium. 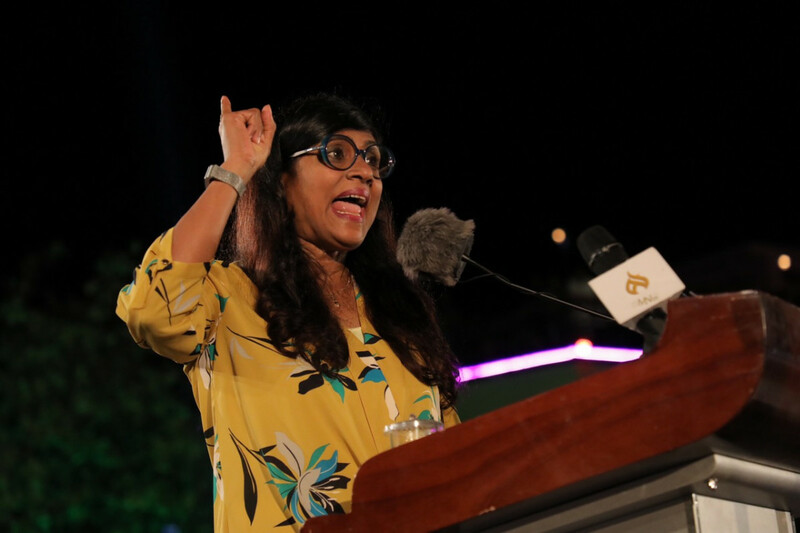 "Solih will win the election with 170,000 votes with the grace of god" Shidhatha. "The whole nation is calling for a change. Citizens have hit rock bottom over the past five years and the country hasn't seen this much tyranny in Maldives history. The administration has also dragged the country into a debt-trap" Shidhatha. "We will uphold our promises. Social protection will be ensured to all citizens. You, the people, have shown me your feelings. Solih is out to work with the citizens, not against them. 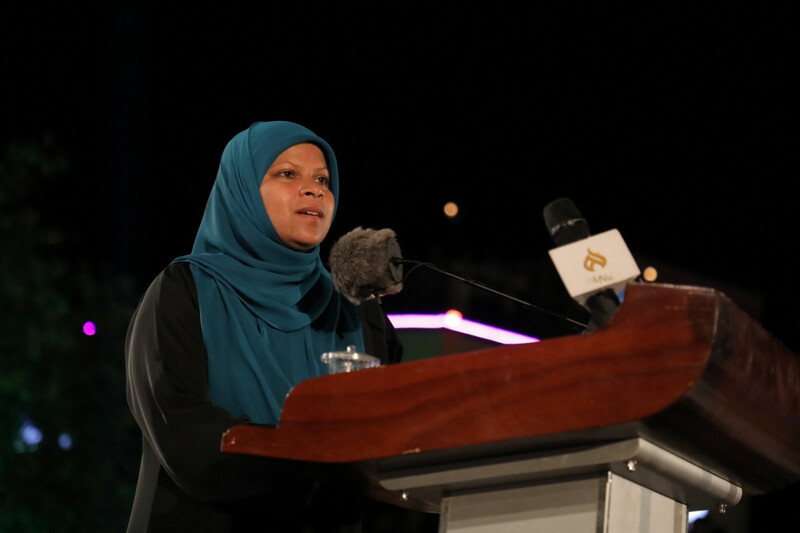 During Solih's tenure, women of all ages will be provided opportunity to progress in their work" Naseem. "Maldives will forever remain a 100% muslim nation. Not even an inch will stretch towards another religion. It will remain the same forever. You need just give Solih a single opportunity on the day of the ballots" Naseem. "I have got results. I have learnt what the people want tonight at this gathering" Naseem. 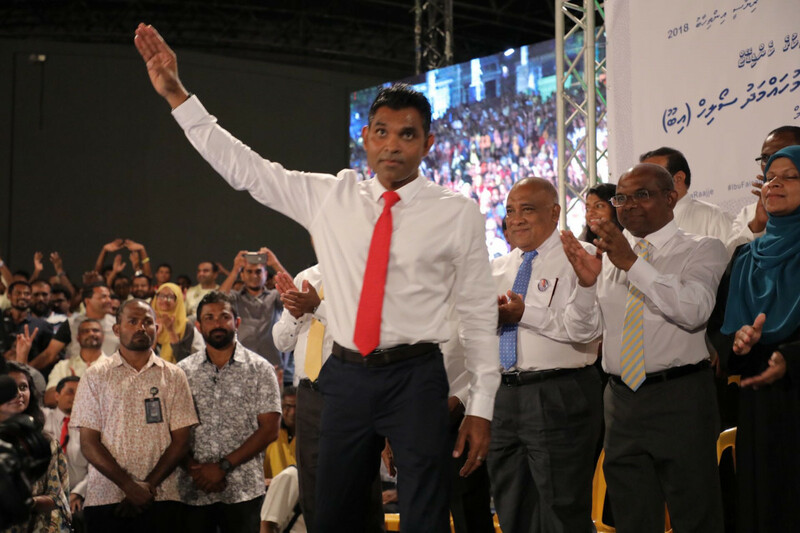 "Maldivians are overjoyed to have such a respected man up for Presidency. He is an honest man" Naseem. 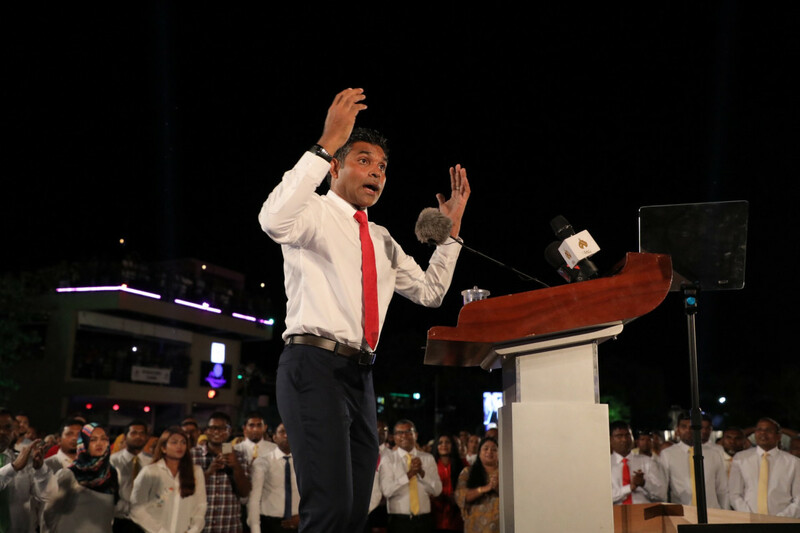 Now speaking is opposition coalition's vice presidential candidate Faisal Naseem. 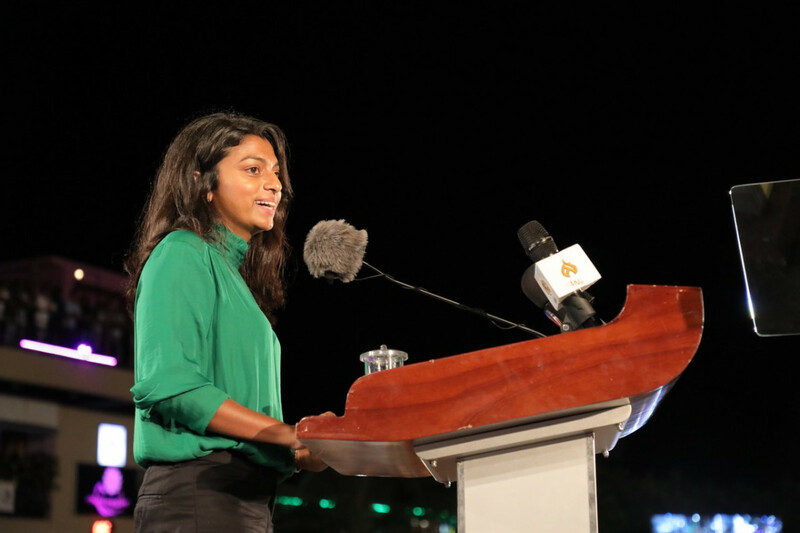 "Since the beginning Maldivians have had deep regard for unity, justice and equality". "The nation's integrity rises above the fear, still. Our chance to say no to this corruption-driven regime is Solih" Eva. "I am not ready to bow down to tyranny and injustice and neither should you be. I'm not ready to give in to misdeeds of corruption and will never be" Eva. Now speaking is MP for north-Galolhu constituency Eva Abdulla. "It's been five years since citizens have been remaining in continuous fear. As the citizens keep observing, the current administration is seen passing bill by bill, carrying out acts of corruption right under the noses of watchful citizens. There doesn't pass a single day where I don't wonder what would happen if abducted journalist Rilwan and blogger Yameen were here. Those families who have been deprived of justice still remain in hope. Corruption is now habitual for the current administration". 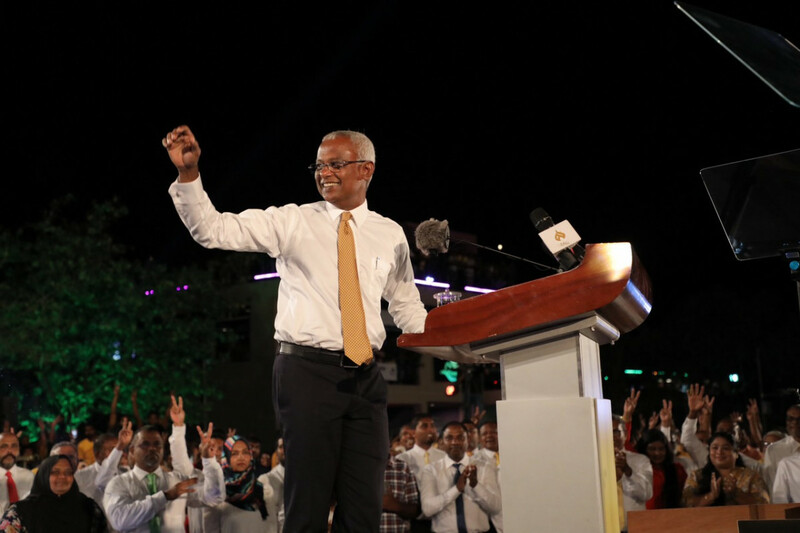 "Solih is the glue that holds us all together. It is important that everyone votes for candidate number two for a change" Solih. 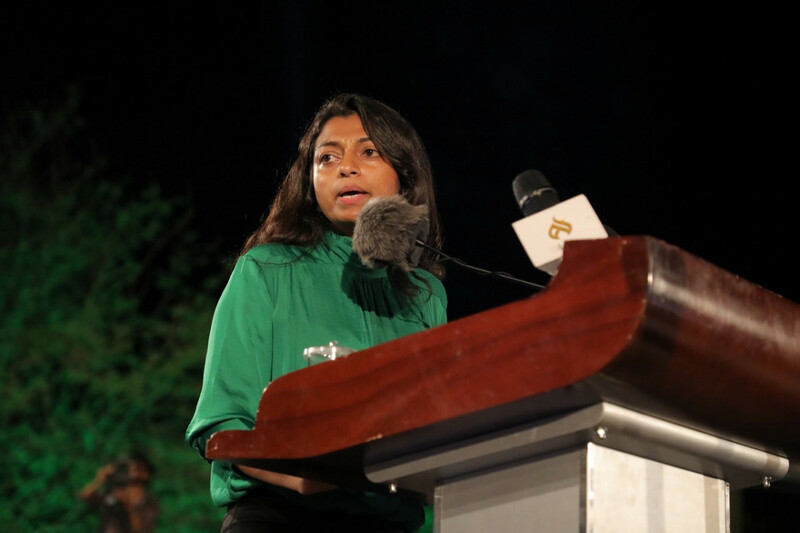 Now speaking is Solih's spokesperson Mariya Ahmed Didi. "Solih assures the citizens of free education". "It is time to pull the nation out of the abyss it has fallen into. The 23rd of September will be a day the country is brought back into the path of reform. We will no longer be pushed to the back of the crowd to stand in silence"
"We will do our role on re-building soured bonds between neighboring countries and the Maldives. Maldives foreign policy will be one of the opposition's highest priorities" Solih. "Citizens have lost their trust in security forces due to the authoritarianism of the current administration. A unity government will never give unlawful orders to the security forces" Solih. 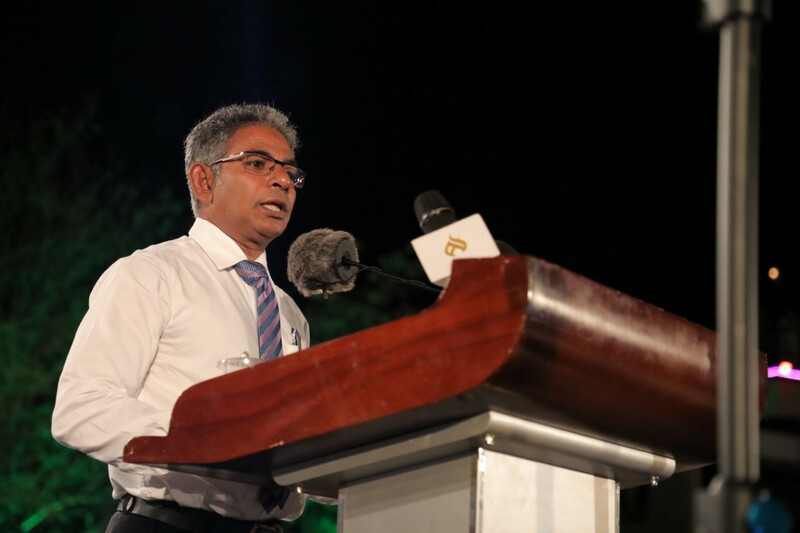 "Will improve living conditions for Male' residents by establishing urban centers" Solih. "No one in this gathering has been coerced to join or partake if they want to keep their employment. The opposition does not do that, we do not coerce civil service employees. Infact, their salaries will be advanced during a coalition government" Solih. "Will make sure youth citizens do not spend their lives on the streets or ones that only play Futsal tournaments. Our government will ensure to bring out the most in the youth. The youth will come out on the day of the election to bring an end to this autocratic rule" Solih. "Schools will follow a single-session roster. Students get free education up to their first degree" Solih. "Opposition's unity government will ensure an organized transport system is established, that links the entirety of Maldives" Solih. "A unity government will ensure development is not created in the minds of the upcoming generations in a negative way that impacts on the Environment. Will not take matters of environment protection lightly" Solih. There will be no room in the Maldives for any other religion other than Islam, which remains the foundation on which the nation was built. "I will not touch even a single coin from the state funds and I will not be a President who enslaves the citizens in a debt trap. Reefs and islands were sold off to anonymous entities during the administration of President Yameen, nobody knows for how much or to whom. When the topic is mentioned, the response is a fancy 25-storey building" says Solih. 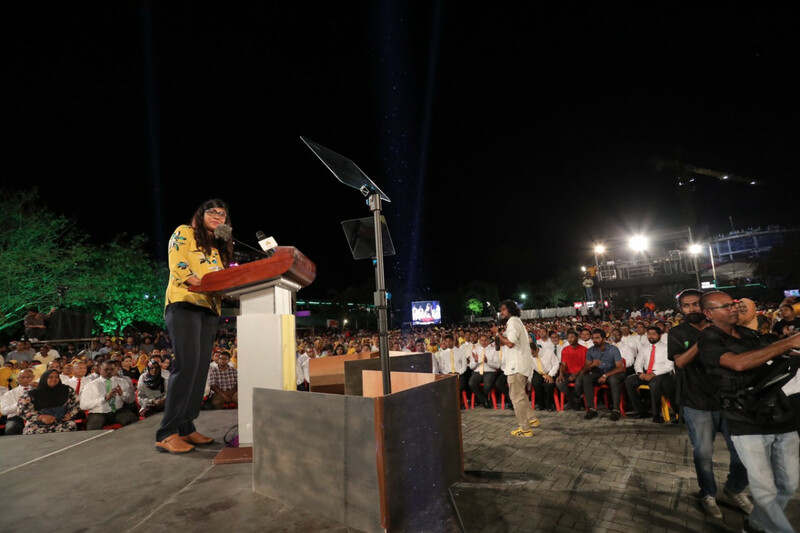 "Presidents Nasheed and Gayoom, Sheikh Imran and several others were prosecuted unjustly. 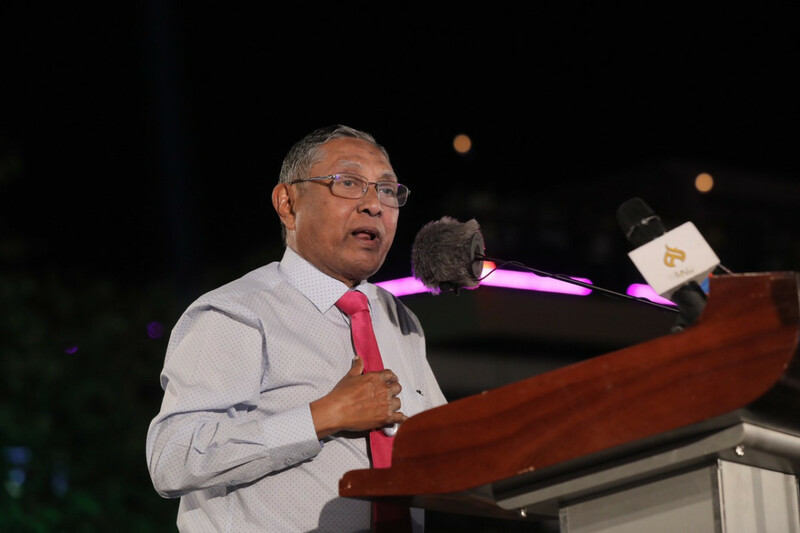 JP's Qasim was prosecuted while he was hospitalized. Every single person who has been prosecuted unjustly will taste freedom. 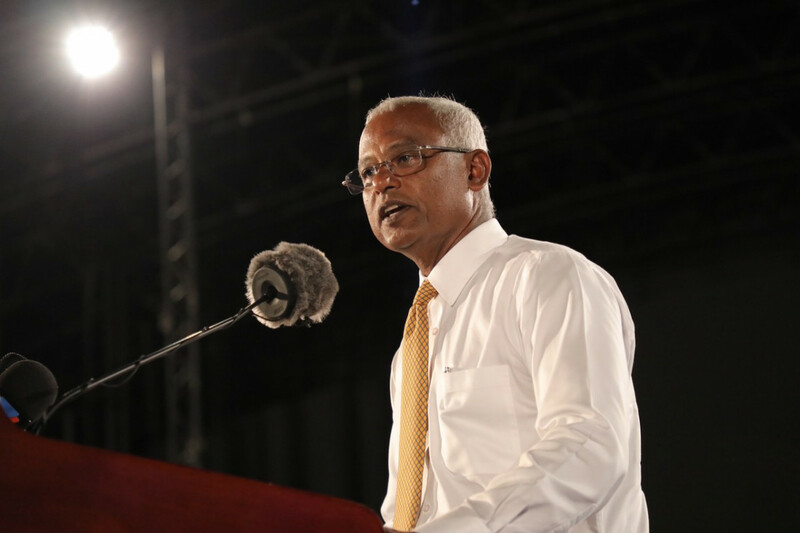 Will focus on serving justice within the first 18 months as elected leader" says Solih. Now speaking is Presidential candidate Ibrahim Mohamed Solih. "The past five years have seen the most corruption in the country's history, we've been going through authoritarianism for half a decade." "I would like to highlight the reform efforts of jailed MP Faris Maumoon, he has spent over a year behind bars. Many such political figures are being unjustly punished. Former President Maumoon Abdul Gayoom's case is also similar, he is receiving unjust punishment in incarceration. This is why we must think of it as a national responsibility to bring Solih into power. To elect him as our next leader. 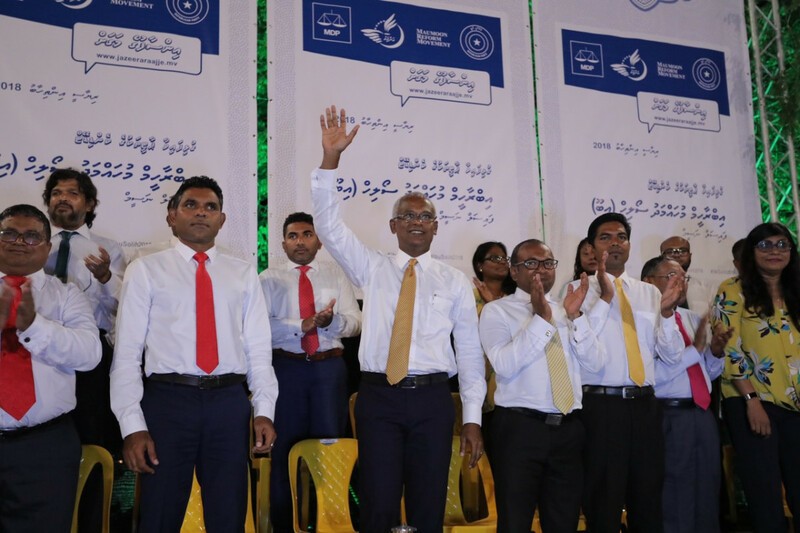 Why are Solih and Naseem special? They put nation before political beliefs. No matter which party you support, let us all become one to save the nation " says Abbas. "We are supporting Ibrahim Mohamed Solih. Development is something we have been seeing all our lives and more efforts need to be put into maintaining development. Taking hefty loans from another nation and involving them in development schemes, is not development" says Abbas. 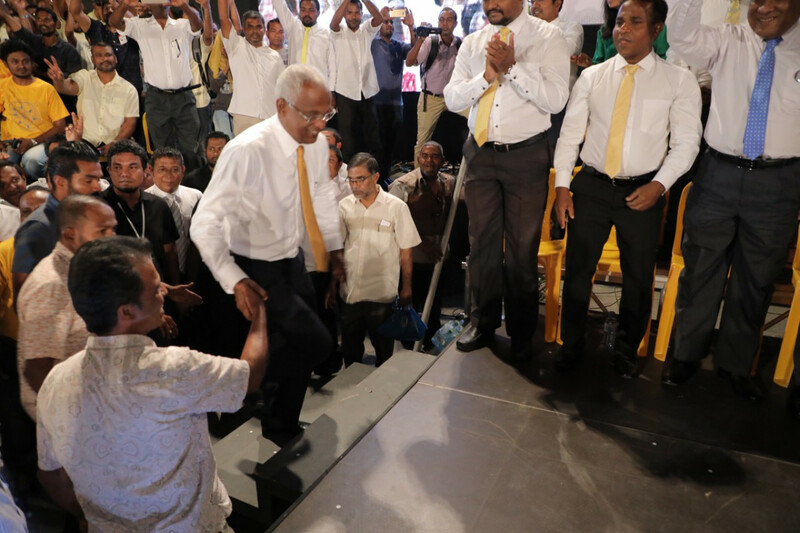 Opposition coalition's Presidential candidate Ibrahim Mohamed Solih arrives shortly after his running mate Faisal Naseem arrived at the gathering. Solih's arrival is welcomed warmly with the optimistic crowd cheering for him with banners. While the gathering is to begin shortly, a number of prominent figures have arrived at the carival in addition to Joint Opposition supporters.